As electricity markets evolve for integrating large amounts of renewable energies and for improving energy efficiency of different sectors, energy and utility companies find it difficult to keep their margins and integrating new technologies they didn’t know before. Today, hundreds of startups and big companies provide technologies and platforms that allow power producers, utilities and other companies in the energy sector to reduce their operating costs, increase revenues and exploit new business opportunities. 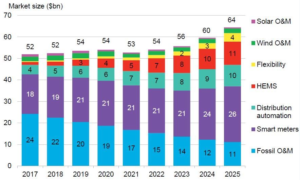 Digitalization of Energy Systems, a report by Bloomberg New Energy Finance (BNEF), predicts significant shifts in the intelligence of digital technologies used in energy from today to 2025, and a big change in the sectors of the energy system that most benefit from these technologies. The same study, shows that investments in digital energy are growing at 20% rate every year, reaching $55 billion globally last year. These are shared among smart meters, energy management systems and automated demand response or microgrid load scheduling. 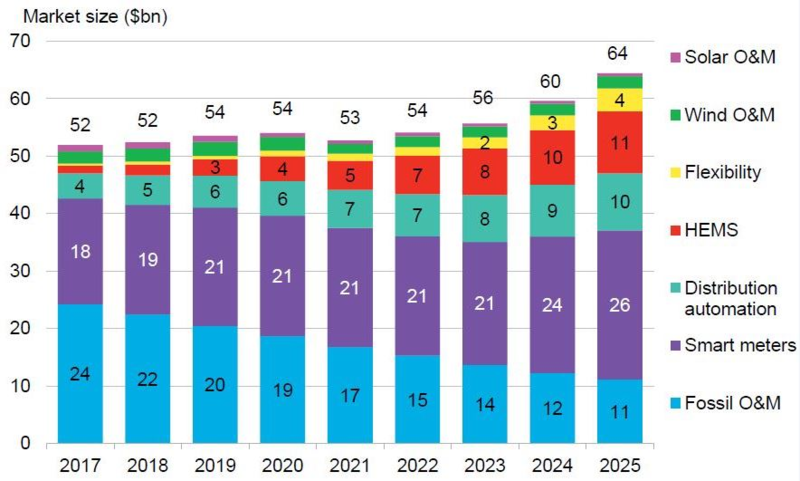 Figure: Market size for digital technologies in energy Source: Bloomberg New Energy Finance. Where is digital energy going?